SUPREME COURT OF INDIA Before :- C.K. Thakker and D.K. Jain, JJ. Speedy trial - 4 years delay in investigation and 8 years in trial - Plea of delay taken up in Supreme Court for first time - Proceedings quashed. For the Appellant :- Ashok Godamgaonkar, K. Maruthi Rao, Ms. K. Radha and Praveen Agrawal, Advocates. For the Respondents :- Ravindra Keshavrao Adsure, Advocate. 1. Pratap Singh v. State of Jharkhand, 2005(1) RCR(Criminal) 836 : 2005(1) Apex Criminal 358 : (2005)3 SCC 551. 2. Santosh De v. Archna Guha, 1995(3) RCR(Criminal) 431 : AIR 1994 SC 1229. 3. Som Mittal v. Government of Karnataka, 2008(2) RCR(Criminal) 92 : 2008(2) RAJ 121 : (2008)3 SCC 574. 4. Jameel v. State of Maharashtra, 2007(1) RCR(Criminal) 738 : 2007(1) RAJ 202 : (2007)11 SCC 420. 5. Satya Narayan Sharma v. State of Rajasthan, 2001(4) RCR(Criminal) 377 : (2001)8 SCC 607. 6. Janata Dal v. H.S. Chowdhary, (1992)4 SCC 305. 7. Kurukshetra University v. State of Haryana, (1977)4 SCC 451. 8. 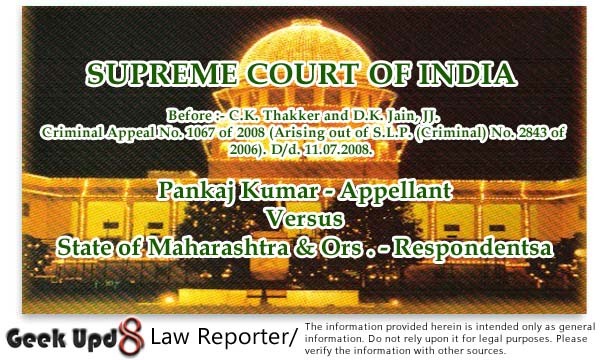 State of Haryana v. Bhajan Lal, 1991(1) RCR(Criminal) 383 : 1992 Supp (1) SCC 335]. 9. Maneka Gandhi v. Union of India, (1978)1 SCC 248. 10. Hussainara Khatoon v. Home Secretary, State of Bihar, (1980)1 SCC 81. 11. Abdul Rehman Antulay v. R.S. Nayak, 1992(2) RCR(Crl.) 634 : (1992)1 SCC 225. 12. "Common Cause" A Registered Society v. Union of India (UOI), 1996(2) RCR(Criminal) 419 : (1996)4 SCC 33. 13. "Common Cause", A Registered Society v. Union of India, (1996)6 SCC 775. 14. Raj Deo Sharma v. State of Bihar, 1998(4) RCR(Criminal) 396 : (1998)7 SCC 507. 15. 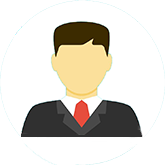 Raj Deo Sharma II v. State of Bihar, 1999(4) RCR(Criminal) 206 : (1999)7 SCC 604. 16. P. Ramachandra Rao v. State of Karnataka, 2002(2) RCR(Criminal) 553 : (2002)4 SCC 578. JUDGMENTD.K. Jain, J. - Leave granted. 2. This appeal arises from the final judgment and order dated 2nd/4th May, 2006 rendered by the High Court of Judicature at Bombay, Bench at Aurangabad, in Criminal Writ Petition No. 149 of 1999. By the impugned judgment, the learned Single Judge has dismissed the petition preferred by the appellant and his mother under Article 227 of the Constitution read with Section 482 of the Code of Criminal Procedure, 1973 (for short 'CrPC'), seeking quashing of the charge-sheet and the consequential proceedings initiated against them in Special Case No. 3 of 1991 pending in the court of Special Judge, Latur. On 12th May, 1998, a First Information Report was lodged against one Sayyad Mohammad Sayyad Ibrahim and eight other persons, inter alia alleging that during the period from 1st October, 1980 to 22nd February, 1982, while working as District Dairy Development Officer, Government Milk Scheme, Bhanara, Sayyad Mohammad Sayyad Ibrahim had conspired with the appellant and his father and had committed mis-appropriation of huge amounts in the purchase of spare parts etc., for the plant. The case was referred to the Anti Corruption Bureau for investigation. 4. Investigations dragged on for over three years and ultimately on 22nd February, 1991, a charge-sheet was filed in the court of Special Judge, Latur against twelve persons for offences punishable under Sections 120B, 409, 420, 465, 468, 471, 477 (A) 101 and 34 of the Indian Penal Code, 1860 (for short 'IPC') and Sections 5(1)(c)(d) along with Section 5(c) of the Prevention of Corruption Act, 1947. In addition thereto, Sections 13(1)(c)(d) read with Section 13 (2) of the Prevention of Corruption Act, 1988 have also been invoked against accused Nos. 1 to 9. The first nine accused were the employees of the Government Milk Plant and the remaining three being the appellant and his father and mother, arraigned as accused Nos. 11, 10 and 12 respectively. 5. As per the charge-sheet, the case of the prosecution, in brief is that the said Sayyad Mohammad Sayyad Ibrahim (accused No .1) and one Pashubhai Narsi Shah (accused No. 10), father of the appellant, were friends since 1976. Accused No. 10 had two concerns styled as India Trading Agency, Mumbai and Dairy Equipment Industries, Mumbai, in the name of his wife (accused No. 12). Accused No. 1, without calling for the quotations for purchase of spare parts for the Milk Plant, got prepared from accused Nos. 10 and 11, bills in small amounts of Rs. 10,000/- each for purchase of spare parts valued at Rs. 2,03,705; got the bills processed from the staff members (accused Nos. 2 to 9) of the said Milk Dairy Unit and made payments in cash and by way of demand drafts to the present appellant. The second accusation is that for two air compressors purchased from M/s Ingersol Rand (India), Mumbai in the year 1978, spare parts of the total value of Rs. 91,469/- were again purchased from the concerns of accused Nos. 10 and 11 despite the fact that quotation had been received from the original supplier. No inspection and verification of the spare parts supplied by the said concerns was carried out; bills were got processed by accused No. 1 from other staff members and payment was again made to accused No. 11 in cash and by demand drafts. The third accusation against all the accused is that an amount of Rs. 64,100/- was paid to one M/s Pankaj Chemicals, Mumbai, managed by accused No. 10, the father of the appellant, for cleaning of the water softening plant supplied by M/s Ingersol Rand (India) Ltd., without actually doing any such work. The Special Judge took cognizance of the complaint and summoned all the accused. 6. Aggrieved, the appellant and his mother (A-12) filed the afore-stated writ petition. During the pendency of the writ petition, the mother of the appellant expired. Accused No. 10, namely, the father of the appellant had also expired earlier. 7. Rejecting the main plea of the appellant that being born on 18th September, 1963, the appellant was a minor at the time of transactions in question in the year 1981 and, therefore, he could not be proceeded against and that even otherwise the charge-sheet did not disclose any offence against the appellant and his mother, by the impugned order, the High Court dismissed the petition. The High Court has come to the conclusion that the appellant has failed to produce any document showing his date of birth and that the charge-sheet prima facie discloses commission of offences by the appellant. Aggrieved by the said decision, the appellant has preferred this appeal. 8. Learned counsel appearing on behalf of the appellant submitted that there was sufficient material on record to show that when the alleged acts of malfeasance took place, the appellant was a minor and had nothing to do with the affairs of the concerns, which had made supplies to the milk plant. He was neither the proprietor nor a partner in the said concerns/firms which were managed by his father, accused No. 10. In support of the proposition that the reckoning date for determining the age of an accused, who claims to be a child, is the date of occurrence and not the date when the offender is produced before the court, reliance was placed on the decision of the Constitution Bench in Pratap Singh v. State of Jharkhand & Anr., 2005(1) RCR(Criminal) 836 : 2005(1) Apex Criminal 358 : (2005)3 SCC 551. Referring us to certain portions of the charge-sheet, learned counsel contended that except for the bald averment that the appellant had prepared bogus bills and had received the payment, no other incriminating material has been brought on record, to show that the appellant was looking after the affairs of the concerns/firms owned or managed by his father and mother, namely accused No. 10 and 12 (since deceased) and, therefore, the conclusion of the High Court that a prima facie case had been made out against the appellant is without any basis. Lastly, it was pleaded that the appellant has been deprived of his constitutional right to have a speedy investigation and trial, inasmuch as the FIR was registered on 12th May, 1987 for the offences allegedly committed some time in the year 1981; charge-sheet was filed on 22nd February, 1991 but till date not a single witness has been examined by the prosecution. In support, reliance was placed on a decision of this Court in Santosh De v. Archna Guha & Ors., 1995(3) RCR(Criminal) 431 : AIR 1994 SC 1229 wherein a delay of eight years in commencing the trial was held to be violative of the right of the accused to a speedy trial and the High Court's decision quashing the criminal proceedings on that ground was affirmed. 9. Learned counsel for the State, on the other hand, submitted that in the light of clear averment in the charge-sheet, implicating the appellant, the High Court was justified in dismissing the writ petition by applying the correct principles to be kept in view while exercising power under Article 227 of the Constitution or under Section 482 CrPC, recently reiterated by a three-Judge Bench of this Court in Som Mittal v. Government of Karnataka, 2008(2) RCR(Criminal) 92 : 2008(2) RAJ 121 : (2008)3 SCC 574. Regarding delay in trial, learned counsel submitted that the prosecution cannot be held responsible for delay at least from the year 1999, when the records had been summoned by the High Court. It was also submitted that even if the date of birth of the appellant is taken as 18th September, 1963, being more than 16 years of age in March, 1981, still he could not be treated as a juvenile under the 1986 Juvenile Justice Act. Learned counsel also placed reliance on the decisions in Pratap Singh (supra) and Jameel v. State of Maharashtra, 2007(1) RCR(Criminal) 738 : 2007(1) RAJ 202 : (2007)11 SCC 420. It was also urged that since offences, punishable under the Prevention of Corruption Act, 1988 have been committed by the appellant, in view of the observations of this Court in Satya Narayan Sharma v. State of Rajasthan, 2001(4) RCR(Criminal) 377 : (2001)8 SCC 607 this Court should be loath to interfere in the matter. 10. The scope and ambit of powers of the High Court under Section 482, CrPC or Article 227 of the Constitution has been enunciated and reiterated by this Court in a series of decisions and several circumstances under which the High Court can exercise jurisdiction in quashing proceedings have been enumerated. Therefore, we consider it unnecessary to burden the judgment by making reference to all the decisions on the point. It would suffice to state that though the powers possessed by the High Courts under the said provisions are very wide but these should be exercised in appropriate cases, ex debito justitiae to do real and substantial justice for the administration of which alone the courts exist. The inherent powers do not confer an arbitrary jurisdiction on the High Court to act according to whim or caprice. The powers have to be exercised sparingly, with circumspection and in the rarest of rare cases, where the court is convinced, on the basis of material on record, that allowing the proceedings to continue would be an abuse of the process of the court or that the ends of justice require that the proceedings ought to be quashed. [See : Janata Dal v. H.S. Chowdhary & Ors., (1992)4 SCC 305 Kurukshetra University & Anr. v. State of Haryana & Anr., (1977)4 SCC 451 and State of Haryana & Ors. v. Bhajan Lal & Ors., 1991(1) RCR(Criminal) 383 : 1992 Supp (1) SCC 335]. 11. Although in Bhajan Lal's case (supra), the court by way of illustration, formulated as many as seven categories of cases, wherein the extra-ordinary power under the afore- stated provisions could be exercised by the High Court to prevent abuse of process of the court yet it was clarified that it was not possible to lay down precise and inflexible guidelines or any rigid formula or to give an exhaustive list of the circumstances in which such power could be exercised. "When the words 'rarest of rare cases' are used after the words 'sparingly and with circumspection' while describing the scope of Section 482, those words merely emphasize and reiterate what is intended to be conveyed by the words 'sparingly and with circumspection'. They mean that the power under Section 482 to quash proceedings should not be used mechanically or routinely, but with care and caution, only when a clear case for quashing is made out and failure to interfere would lead to a miscarriage of justice. The expression "rarest of rare cases" is not used in the sense in which it is used with reference to punishment for offences under Section 302 IPC, but to emphasize that the power under Section 482 Cr.P.C. to quash the FIR or criminal proceedings should be used sparingly and with circumspection." 13. Bearing in mind the above legal position, we are of the opinion that, for the reasons stated hereafter, the ends of justice require that prosecution proceedings in the instant case be quashed. 14. Time and again this Court has emphasized the need for speedy investigations and trial as both are mandated by the letter and spirit of the provisions of the CrPC. (In particular, Sections 197, 173, 309, 437(6) and 468 etc.) and the constitutional protection enshrined in Article 21 of the Constitution. Inspired by the broad sweep and content of Article 21 as interpreted by a seven-Judge Bench of this Court in Maneka Gandhi v. Union of India & Anr., (1978)1 SCC 248 in Hussainara Khatoon & Ors. v. Home Secretary, State of Bihar, (1980)1 SCC 81 this Court had said that Article 21 confers a fundamental right on every person not to be deprived of his life or liberty except according to procedure established by law; that such procedure is not some semblance of a procedure but the procedure should be 'reasonable, fair and just'; and therefrom flows, without doubt, the right to speedy trial. It was also observed that no procedure which does not ensure a reasonably quick trial can be regarded as 'reasonable, fair or just' and it would fall foul of Article 21. The Court clarified that speedy trial means reasonably expeditious trial which is an integral and essential part of the fundamental right to life and liberty enshrined in Article 21. 15. The exposition of Article 21 in Hussainara Khatoon's case (supra) was exhaustively considered afresh by the Constitution Bench in Abdul Rehman Antulay & Ors. v. R.S. Nayak & Anr., 1992(2) RCR(Crl.) 634 : (1992)1 SCC 225. Referring to a number of decisions of this Court and the American precedents on the Sixth Amendment of their Constitution, making the right to a speedy and public trial a constitutional guarantee, the Court formulated as many as eleven propositions with a note of caution that these were not exhaustive and were meant only to serve as guidelines. For the sake of brevity, we do not propose to reproduce all the said propositions and it would suffice to note the gist thereof. These are : (i) fair, just and reasonable procedure implicit in Article 21 of the Constitution creates a right in the accused to be tried speedily; (ii) right to speedy trial flowing from Article 21 encompasses all the stages, namely the stage of investigation, inquiry, trial, appeal, revision and retrial; (iii) in every case where the speedy trial is alleged to have been infringed, the first question to be put and answered is - who is responsible for the delay ? ; (iv) while determining whether undue delay has occurred (resulting in violation of right to speedy trial) one must have regard to all the attendant circumstances, including nature of offence, number of accused and witnesses, the work-load of the court concerned, prevailing local conditions and so on - what is called, the systemic delays; (v) each and every delay does not necessarily prejudice the accused. Some delays may indeed work to his advantage. However, inordinately long delay may be taken as presumptive proof of prejudice. In this context, the fact of incarceration of accused will also be a relevant fact. The prosecution should not be allowed to become a persecution. But when does the prosecution become persecution, again depends upon the facts of a given case; (vi) ultimately, the court has to balance and weigh several relevant factors - 'balancing test' or 'balancing process' - and determine in each case whether the right to speedy trial has been denied; (vii) Ordinarily speaking, where the court comes to the conclusion that right to speedy trial of an accused has been infringed the charges or the conviction, as the case may be, shall be quashed. But this is not the only course open and having regard to the nature of offence and other circumstances when the court feels that quashing of proceedings cannot be in the interest of justice, it is open to the court to make appropriate orders, including fixing the period for completion of trial; (viii) it is neither advisable nor feasible to prescribe any outer time-limit for conclusion of all criminal proceedings. In every case of complaint of denial of right to speedy trial, it is primarily for the prosecution to justify and explain the delay. At the same time, it is the duty of the court to weigh all the circumstances of a given case before pronouncing upon the complaint; (ix) an objection based on denial of right to speedy trial and for relief on that account, should first be addressed to the High Court. Even if the High Court entertains such a plea, ordinarily it should not stay the proceedings, except in a case of grave and exceptional nature. Such proceedings in High Court must, however, be disposed of on a priority basis. 16. Notwithstanding elaborate enunciation of Article 21 of the Constitution in Abdul Rehman Antulay (supra), and rejection of the fervent plea of proponents of right to speedy trial for laying down time-limits as bar beyond which a criminal trial shall not proceed pronouncements of this Court in "Common Cause" A Registered Society v. Union of India (UOI) & Ors., 1996(2) RCR(Criminal) 419 : (1996)4 SCC 33, "Common Cause", A Registered Society v. Union of India & Ors., (1996)6 SCC 775, Raj Deo Sharma v. State of Bihar, 1998(4) RCR(Criminal) 396 : (1998)7 SCC 507 and Raj Deo Sharma II v. State of Bihar, 1999(4) RCR(Criminal) 206 : (1999)7 SCC 604 gave rise to some confusion on the question whether an outer time limit for conclusion of criminal proceedings could be prescribed whereafter the trial court would be obliged to terminate the proceedings and necessarily acquit or discharge the accused. The confusion on the issue was set at rest by a seven-Judge Bench of this court in P. Ramachandra Rao v. State of Karnataka, 2002(2) RCR(Criminal) 553 : (2002)4 SCC 578. Speaking for the majority, R.C. Lahoti, J. (as his Lordship then was) while affirming that the dictum in A.R. Antulay's case (supra) is correct and still holds the field and the propositions emerging from Article 21 of the Constitution and expounding the right to speedy trial laid down as guidelines in the said case adequately take care of right to speedy trial, it was held that guidelines laid down in the A.R. Antulay's case (supra) are not exhaustive but only illustrative. They are not intended to operate as hard and fast rules or to be applied like a strait-jacket formula. Their applicability would depend on the fact-situation of each case as it is difficult to foresee all situations and no generalization can be made. It has also been held that it is neither advisable, nor feasible, nor judicially permissible to draw or prescribe an outer limit for conclusion of all criminal proceedings. Nonetheless, the criminal courts should exercise their available powers such as those under Sections 309, 311 and 258 of CrPC to effectuate the right to speedy trial. In appropriate cases, jurisdiction of the High Court under Section 482 CrPC and Articles 226 and 227 of the Constitution can be invoked seeking appropriate relief or suitable directions. The outer limits or power of limitation expounded in the aforenoted judgments were held to be not in consonance with the legislative intent. 18. Tested on the touchstone of the broad principles, enumerated above, we are of the opinion that in the instant case, appellant's constitutional right recognised under Article 21 of the Constitution stands violated. It is common ground that the First Information Report was recorded on 12th May, 1987 for the offences allegedly committed in the year 1981, and after unwarranted prolonged investigations, involving afore-stated three financial irregularities; the charge-sheet was submitted in Court on 22nd February, 1991. Nothing happened till April, 1999, when the appellant and his deceased mother filed criminal writ petition seeking quashing of proceedings before the trial court. Though, it is true that the plea with regard to inordinate delay in investigations and trial has been raised before us for the first time but we feel that at this distant point of time, it would be unfair to the appellant to remit the matter back to the High Court for examining the said plea of the appellant. Apart from the fact that it would further protract the already delayed trial, no fruitful purpose would be served as learned Counsel for the State very fairly stated before us that he had no explanation to offer for the delay in investigations and the reason why the trial did not commence for eight long years. Nothing, whatsoever, could be pointed out, far from being established, to show that the delay was in any way attributable to the appellant. Moreover, having regard to the nature of the accusations against the appellant, briefly referred to above, who was a young boy of about eighteen years of age in the year 1981, when the acts of omission and commission were allegedly committed by the concerns managed by his parents, who have since died, we feel that the extreme mental stress and strain of prolonged investigation by the Anti Corruption Bureau and the sword of damocles hanging perilously over his head for over fifteen years must have wrecked his entire career. Be that as it may, the prosecution has failed to show any exceptional circumstance, which could possibly be taken into consideration for condoning the prolongation of investigation and the trial. The lackadaisical manner of investigation spread over a period of four years in a case of this type and inordinate delay of over eight years (excluding the period when the record of the trial court was in the High Court), is manifestly clear. Thus, on facts in hand, we are convinced that the appellant has been denied his valuable constitutional right to a speedy investigation and trial and, therefore, criminal proceedings initiated against him in the year 1987 and pending in the court of Special Judge, Latur, deserve to be quashed on this short ground alone. 19. For the view we have taken, we deem it unnecessary to go into the merits of the accusations against the appellant as also the question of his age, at the time of commission of alleged offences. 20. Consequently, the appeal is allowed and the proceedings against the appellant in criminal case arising out of FIR No. 78 of 1987 are hereby quashed.